The Australian engineering firm that manufactures Brewin’s Water Recycling Shower, CINTEP, estimates that with this shower a typical four-person household would save about 20,000 to 40,000 gallons of water per year. Brewin studied engineering at Cambridge and served as an officer in the British Army’s Corps of Royal Engineers. He then began a master’s in Industrial Design Engineering at the Royal College of Art and Imperial College. It was during this time, at RCA, that Brewin developed and patented the re-circulating shower technology. We asked this inventor about his inspiration, his penchant for creating sustainable products, and his newest invention: Concrete Canvas, a type of flexible concrete that he uses to make shelters for rapid deployment in disaster relief and remote situations. Business Insider: Tell us about the water recycling shower. Peter Brewin: The shower starts with fresh water each time then cleans and reuses 70 per cent of the water. Because the water is returned very rapidly to the shower and is heated only in the shower it uses 70 per cent less energy than a conventional boiler fed shower. Water has a very high specific heat capacity which means that a huge amount of energy is required to heat cold water for a shower so the energy saving is a very considerable environmental and cost benefit. BI: When and how did you come up with the idea for the water recycling shower? PB: I invented the shower while studying a post graduate degree at the Royal College of Art and Imperial College London in 2005. I had previously designed a shower head to reuse the waste water while people wait for a shower to warm up so I had done some work in the area. I chose the shower from a large range of ideas I had at the time as it embodied a lot of neat synergies from an engineering perspective and had both a strong environmental and consumer benefit. BI: Pasteurization is an important part of the recycled water process. How did you decide to pasteurize the water? And why is that more effective than other solutions? PB: There are a large range of potential water sterilization technologies: UV, ozone, etc. All have with their own benefits and disadvantages. The main issue with pasteurisation is that it requires a lot of energy because of water’s high specific heat capacity. The main benefits are that it requires no chemicals and can be very rapid. Because in a recirculating shower you are starting with warm water and you have to heat it anyway it was possible to use a heat exchanger to heat the water to a high enough temperature to achieve pasteurization without a significant additional energy input. BI: Tell us about the process of actually creating the shower. Did you tinker with it for years or was this a quick discovery? It took me a year working full time at the university to develop the first demonstration prototype, although I had done some work previously on a shower project. I went through a large number or prototypes for some of the systems in particular working on the hydrocyclone geometry. BI: Obviously the shower is very environmentally-friendly. Did you have an interest in environmental issues before you created the shower? How important is it to you for your products to be green? PB: I am a pragmatist who loves engineering, and it is obvious that if we are to continue enjoying the level of civilisation we have at the moment we must find ways to do so more efficiently. I feel that in order to make a difference a product has to be better for the end user as well as using less resources. Otherwise it will never stand a chance of being adopted widely. Concrete Canvas is similar in that it is much more efficient than conventional ways of using concrete which saves our customers time and money and at the same time creates less carbon dioxide. BI: What impact do you think that this shower will have on the world? PB: I hope that it will enable people to use less resources without having to make sacrifices. BI: Had you ever invented anything else before the water recycling shower? PB: I have always found I have a lot of ideas and as a child was perpetually building my ideas. At Cambridge I worked with some friends on an idea for a more efficient tumble dryer and a new idea for a materials handling system based on the way ants use simple codes to organise themselves. 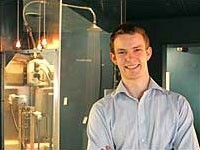 While at the RCA and Imperial I had a lot of opportunity to work on a range of my inventions, many of which won awards. These included Concrete Canvas, a new type of helmet camera that enabled you to save footage after something happened, a type of floor tile that helped people escape fires, a system for diagnosing pronation in runners, a water saving shower head and a few others. BI: Are you working on any other inventions now? PB: At the moment Concrete Canvas is very consuming. The production equipment has been developed in-house and contains a very large number of innovations and the material also has immense potential. We are also working hard on a number of really exciting new products from fire proof to bullet proof variants.